Railpictures.ca - John Pittman Photo: GP20c-eco locomotives CP 2211 and CP2292 with GP38-2 CP 7307 in the middle (formerly D&H, ex-Lehigh Valley) are southbound at Parkside Drive grade crossing in Waterdown. They are returning light after helping northbound train CP 142 uphill from Hamilton to Waterdown North. According to www.cpr.ca “Facts about CP in Hamilton” The grade to the north is the second steepest mountain grade on CP’s network (including the Rockies) and is six miles long from Hamilton to Waterdown. | Railpictures.ca – Canadian Railway Photography – photographie ferroviaire Canadienne. 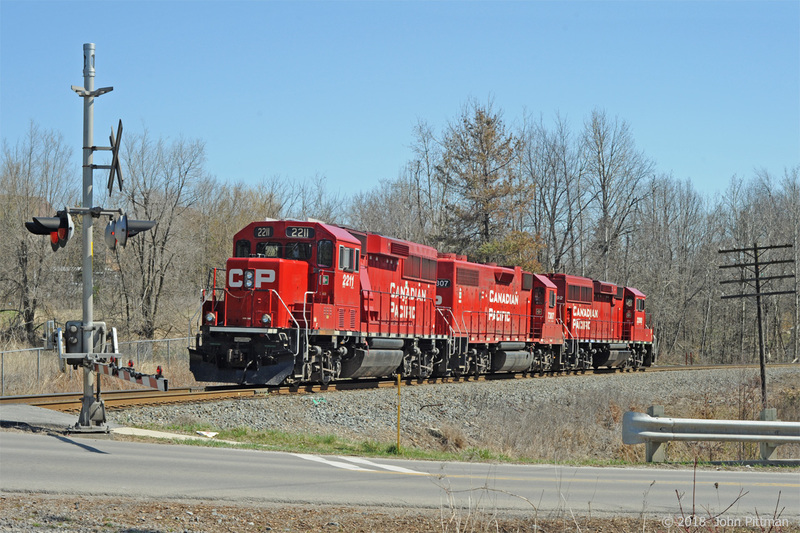 Caption: GP20c-eco locomotives CP 2211 and CP2292 with GP38-2 CP 7307 in the middle (formerly D&H, ex-Lehigh Valley) are southbound at Parkside Drive grade crossing in Waterdown. They are returning light after helping northbound train CP 142 uphill from Hamilton to Waterdown North. According to www.cpr.ca "Facts about CP in Hamilton"
The grade to the north is the second steepest mountain grade on CP's network (including the Rockies) and is six miles long from Hamilton to Waterdown. DPU operation is good in that throttle and brake settings are automatically co-ordinated (subject to radio reception). But there are several reasons why these helper units are manned. The necessary electronics (Locotrol) are normally installed only in modern mainline freight locomotives, not road switchers. These pushers are only traveling about 10 miles out of Hamilton, then cutting off – a crew is required to couple onto the end of the train, uncouple beyond Waterdown, and to run the locomotives back to Hamilton. Are these units manned, or can they be used as distributed power units? Dumb question I know.